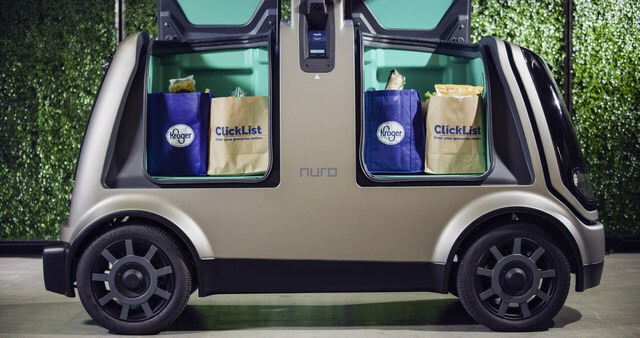 Grocery giant Kroger and autonomous vehicle startup Nuro launched their driverless delivery service Thursday in Scottsdale, Arizona. It is the first market for the two companies, which first announced their partnership back in June. To start out, only one store is involved in the experiment: the Kroger-owned Fry’s Food Store on East McDowell Road. Customers can place orders via Fry’s website or mobile app. Grocery orders can be scheduled for same-day or next-day delivery. The delivery fee is $5.95 per order and there is no minimum order amount. Whether Fry’s Food Store shoppers see a benefit from the driverless deliveries remains to be seen. Unlike a typical, human-powered delivery service, customers will need to walk to the curb to retrieve their groceries — in anticipation of eventually using human-free delivery vehicles. The operators are certainly banking on the novelty of receiving produce, cold cuts, and a six-pack of beer from a vehicle that looks like a toaster on wheels in overcoming any initial feelings of inconvenience by the customers.